How frustrating is it when you can't get decent cell phone coverage in your own home? The phone works fine in the kitchen, but not your bedroom – you end up with dropped calls and poor sound…grrr. For the conversations that count, you need reliable reception. 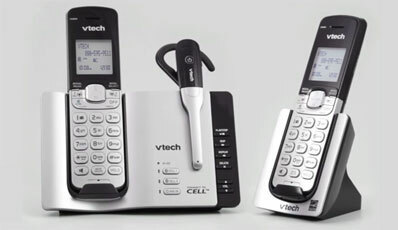 VTech’s DS6671-3 Connect to Cell™ phone system ($99.95 from vtech.com) enables you to make and receive mobile phone calls with your home phone for better sound quality and clarity. And, you get the added benefit of using a comfortable handset or headset for mobile calls. Connect to Cell takes advantage of the zone in the house with the best cellular coverage, ensuring you don't have to worry about dropped calls anymore. Through a simple one-button Bluetooth pairing process, you'll be able to conduct all your calls through the VTech handset or headset, while your cell phone remains connected and charging. These systems work with or without a landline, so they're great for cellular-only households. Use up to two cellular lines and one landline with your cordless system. Then, enjoy the freedom to make and receive calls on all three lines – all at once. Enter through August 22nd, 2014 for your chance to win one of your own! We will randomly select one (1) winners from the entries. No purchase is necessary to win. One entry per person. The giveaway will end at 11:59pm on August 22nd, 2014. Void where prohibited. U.S. residents only. Click here for the full rules. I have to resort to using Skype in the house, since my reception is so bad there, so this sounds great! Gotta love anyway to boost cell signal in the house! I have the very issue that this article speaks to…great coverage in one area and very poor in another (the basement). I would love to be able to add the Vtech option to my life! It would be nice to never have to go “on the porch” to carry on a decent telephone conversation. I’m always using my cell here at home and sometimes calls can be horrible depending upon where I am. This would be the perfect solution to resolve that problem! This sounds like a perfect solution for my house cell coverage problems. I have very poor reception in my music room, this would be great to alleviate the problem. When I’ve used my cellphone in the house, the reception was so weak, I could not hear the person on the other end. This would solve that problem. Cheaper option than a femtocell? would be great for conference calls when i’m worried about drops! It would allow me to freely take calls in any room of my home. Currently, I can only get okay reception in 1/2 the house. and would like to use our landline hand and headsets. I have the exact problems they talk about so this would be awesome. Right now I might as well have a corded phone because you can’t move from one room to the next. This is absolutely brilliant!! I work from home and this would make it so much easier! This would work well in my fiance’s home. You have to be around the perimeter of her house to be sure that your call isn’t dropped. I’m so tired of standing in one spot in the house when I get a call on my cell. This looks like such a wonderful solution! My calls always drop from with in my house, this would help immensely. Our home cell coverage is awful, I would love this! This would eliminate my dropped calls at home. I am impressed. I too suffer with connectivity issues. I have a house like this! I could use this! Best cellular coverage, ensuring not to worry about dropped calls anymore. I will never have suckey reception again! This product would be wonderful in my mother’s home that does have the greatest service throughout the entire house. Sometimes have to go outside to get reception hoping this will help. We recently began having trouble with reception in the house. Not sure why, but it’s super frustrating! I had resorted to forwarding my cellphone to my home land-line because the reception in my home is so sketchy but most of the time I forget the do that until I get a call. I had been wishing that such a device as this one would be made available and here it is. This guy’s gotta have it. It’s great because after the phones are paired via Bluetooth,it connects automatically when in range. Fantastic. 3 teenagers and associated devices. Need I say more? This would be awesome! I have to travel over 3 miles just to get my cell voice messages!! We have little to no cell reception in our house. While this sounds great for areas in my hone, I would take it when I visit my mother. In her rural area, if you move an inch while using your phone calls are dropped or reception is poor. Definitely wld like too try this. I think it is great. I also have poor reception in my house and neighborhood. Verizon put up a new cell tower sometime in the past year or so, making it by far the strongest cell signal in this area (only AT&T has any coverage at all here), and I got a free Verizon phone. So now all that’s needed is to sign up for a plan and get something like this Vtech system. needs this!! She never has reception in her house!! I would finally be able to put my phone on the charger when I get home in the evening and leave it there long enough to fully charge! Plus, and this is a huge PLUS, I would be able to talk while in the dining room! I also really like the idea of using a “home phone” because they are much more comfortable to tuck between your ear and shoulder while trying to complete tasks that require both hands. This would be so wonderful, I need one of these I have terrible service at home. It would be nice to no longer get the static on my phone as I move around the house. This phone would help me so much. I work from home and everyone uses my cell number…it would be so much easier if I could answer those calls on my home phone. It would increase the call quality so much and be so much more comfortable to hold! Like other comments I too have to resort to using my home computer for calls. I have yet found a spot in my new house that gets good cell reception but this may help. I would be able actually be able to take conference calls rather than have people call me on my home phone.